So, I was at Lindsay's Organic Salon in my quaint historic town of Leesburg, VA to get my hair done for the Fashion Week photo shoot. Right in front of me I noticed a basket of scrumptious-looking bath goodies. The granular-exfoliating gingerbread man soap is what first caught my attention. 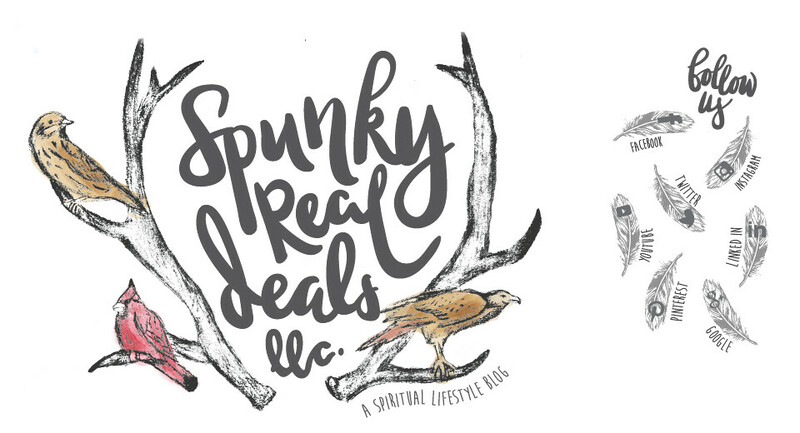 Sarah Buona, whom Co-owns Lindsay's Organic Salon, also runs her own Organic bath and body business by the name of Terreno Organics! She is one busy lady:) Sarah handed me a jar of her Grapefruit & Sweet Orange Terreno Organics Body Butter to try while getting my hair all done up! This is the life I tell ya! I opened up the jar and I believe I have never seen or felt a body butter quite so thick! Even in the photos you can visibly see the definition of those deep-luscious body butter ridges. 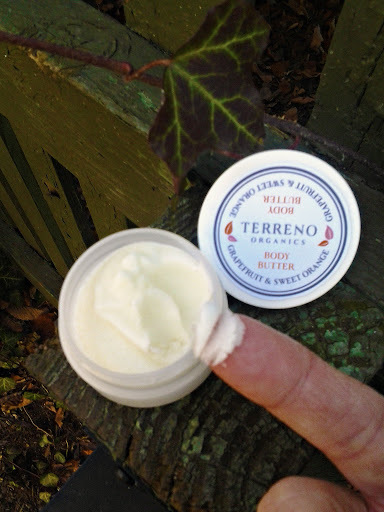 I L-O-V-E...LOVE the thickness of the Terreno Organics Body Butter. A teeny-tiny bit really goes a long way...actually a fingertips worth will moisturize both hands completely! 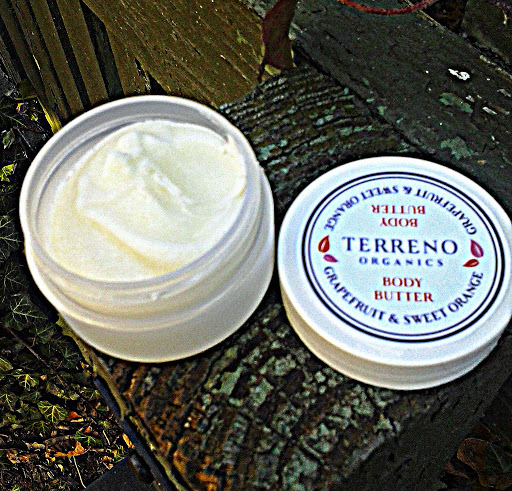 The Grapefruit & Sweet Orange scent of Terreno's body butter is airy light. The scent is like the waft of a rose...the scent pleasantly comes in and out as you smell it. You can feel & even smell the purity and true quality of Terreno Organic's ingredients. 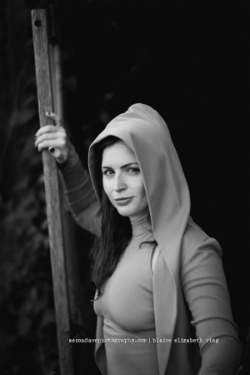 In fact, Sarah is extraordinarily passionate about the quality of ingredients that go into her products and that is a company you want to purchase from! Who is ready for a Terreno Organics Body Butter that melts into your skin like butter into a hot skillet giveaway?